Perhaps Trump is saying: Smile! The entire world is watching us! 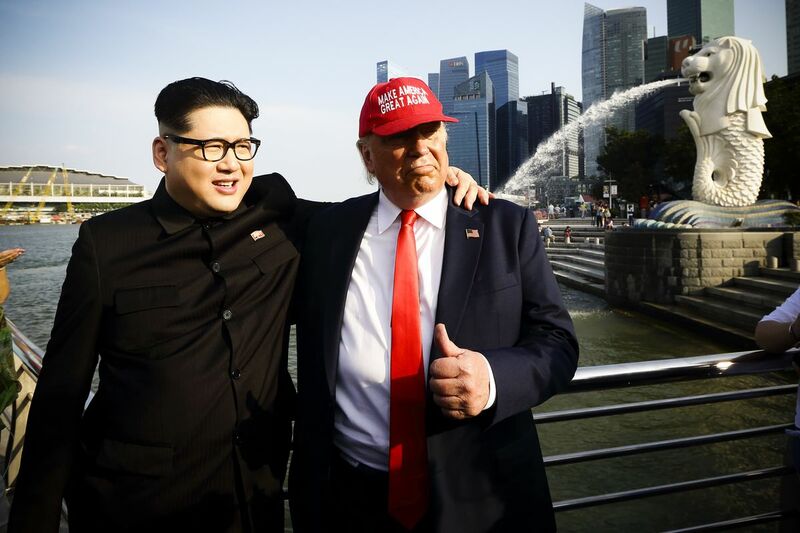 Today was the big day -- two unpredictable leaders meeting in Singapore, talking about the serious issue of nuclear weapons. 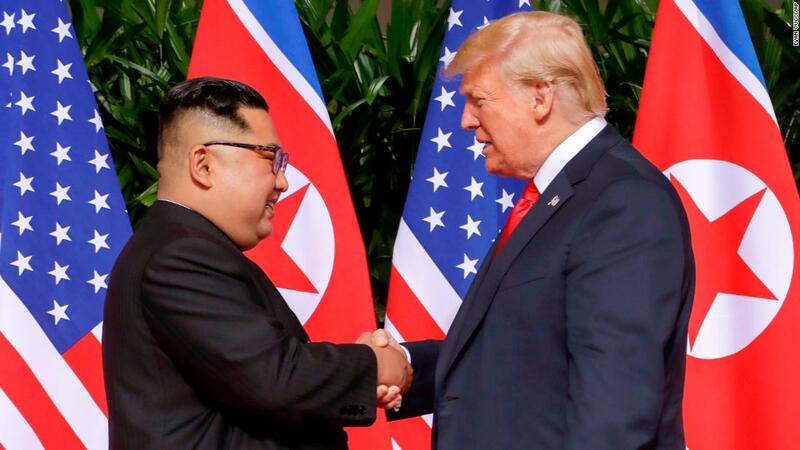 In the end it looked like the perfect photo opportunity for both North Korean leader Kim Jong-un and US President Donald Trump. They met, shook hands, smiled at the cameras and then retreated to supposedly thrash out a deal. 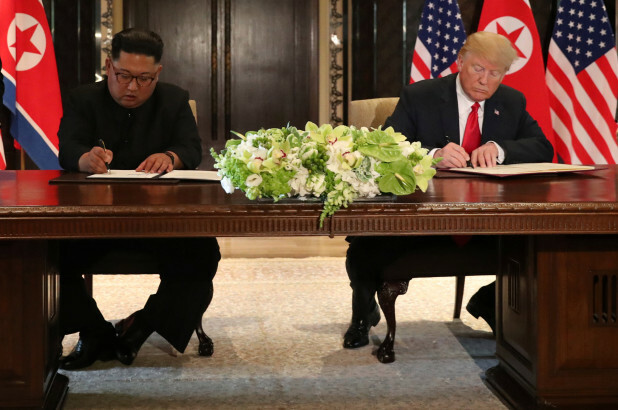 They unexpectedly signed an agreement where Trump "committed to provide security guarantees" to North Korea, and Kim "reaffirmed his firm and unwavering commitment to complete denuclearization of the Korean peninsula." The agreement has no specific timeline or what exact steps Kim needs to take to prove that he is dismantling nuclear weapons in his country or having inspectors checking for accountability. Trump even said during a news conference that the naval drills the US and South Korea conducted would be suspended because they were "provocative" -- probably to the horror of South Korea and Japan. Were they even consulted on what Trump would say? And of course these exercises are supposed to be "provocative" to keep North Korea in line, but now Trump is using the same vocabulary as the Pyongyang. What side are you on, Trump? While Kim retired to his lavish room in the St Regis Singapore that the Singaporean government said would pay for, Trump had a ball taking reporters' questions for over an hour. "I don't want to go against the press. Today is too important." 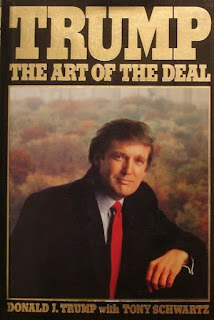 "He's a very talented man," Trump says of Kim. "I also learned he loved his country very much." [If Trump is wrong about trusting Kim Jong-un?] "I may be wrong, I mean I may stand before you in six months and say, 'Hey, I was wrong. I don't know that I'll ever admit that but I'll find some kind of excuse." While commentators are optimistic that the two leaders have moved away from bellicose statements and now talk of a new relationship between the US and DPRK, the threats were started by Trump himself and now he has deescalated them. Why is he being praised for that? Without having to promise any specifics, Kim definitely won this round. Perhaps Trump needs to re-read his book, The Art of the Deal, because he was hoodwinked by Kim who hardly did anything for this summit except show up.